I like to see patterns in things around me and today I wanted to make the connection between the architecture both around and inside of us. Our bodies are fantastically engineered, it’s just that we can’t see it as it’s hidden from us (unless we’re dead and in that case I’m not sure it’s relevant to us by then). The body uses geometry and patterns to create structures and the strongest shape is widely accepted as being the triangle because of its ability to distribute force equally along all of its sides. Three arches make up the tripod of the foot - the medial longitudinal, lateral longitudinal and transverse. 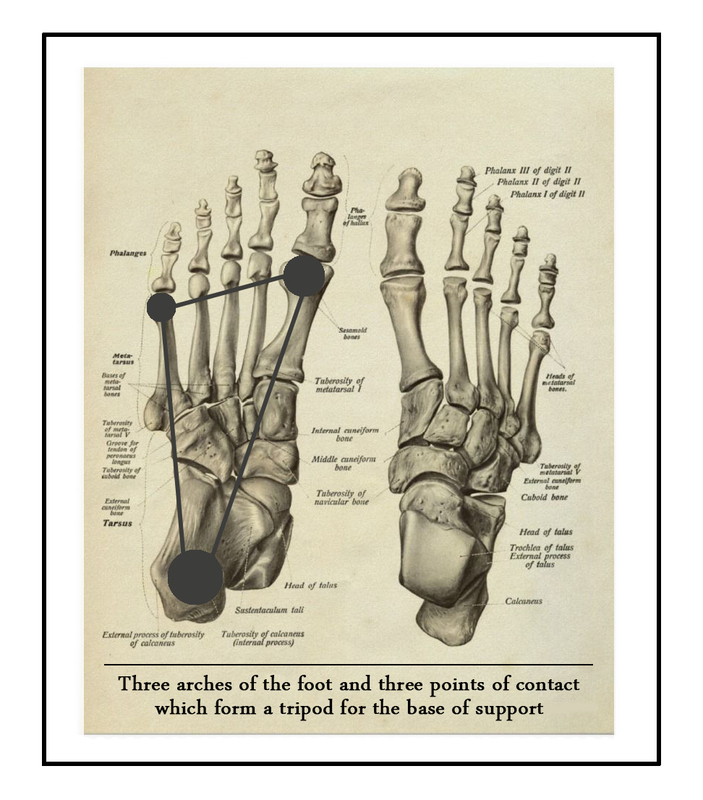 The three points of contact with the ground should be the heel and the 1st and 5th metatarsal heads, which together form our base of support and the second cuneiform marking the centre of mass for the foot. The wider our base of support is, the greater stability, so if we can’t access the widest possible tripod structure when we stand and walk then compensations can occur. If we are more stable with a wide base of support, then it follows we are less stable when it is narrow; imagine how you would feel if your own contact with the ground was the size of an ice skate. No doubt with an ice skate sized base of support, your postural setup would be sub-optimal and this adaptation echoes all the way up the body because the foot isn’t languishing alone in the wilderness; it’s connected to everything. For all of us that walk, this has implications. Every step we take, we’re using this tripod and if we’re ice skating everywhere it’s very likely this will create problems in our body. There is no predictable way to know what strategy each body will use to cope with dysfunction as it varies from person to person. If you feel you have pain that no one has been able to resolve, I look forward to connecting over a session. i. Have a look at your foot; feel all along the bottom of it and see if you can feel any calluses or places that feel as if they bear weight. This will be apparent by the quality of the skin; the softer the skin, the less wear and weight it takes. ii. Swap feet and do the same with the other foot. Is the pressure and wear at the same points on both feet? iii. Walk around slowly and see if you can feel where you place your foot each step you take. Visualise the areas that you noticed were callused as they touch the ground.